We are back again, with another tag team review by myself, Chris Mirjahangir, and Andrew Nguyen for this S.H. MonsterArts figure. The toy review is broken into two parts, each a reflection by that particular reviewer. 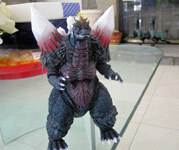 Released in March 2012, the SH MonsterArts figure of SpaceGodzilla is the third release in the SH MonsterArts line. Standing at a height of about 16.5cm if one were to include SpaceGodzilla's shoulder crystals, the figure is nearly at the correct height with that he was in the movie in comparison to Godzilla. Designed by legendary Godzilla sculptor Yuji Sakai, the SH MonsterArts SpaceGodzilla figure does capture to an outstanding degree the look of the suit from the movie if not enhancing it to a more fearsome visage. The coloring for the skin is very accurate to its movie counterpart along with the skin texture as well. As for the dorsal fins and shoulder crystals, the figure had them in whitish color similar to that of pearls while the horn is translucent orange, both of which can be seen in this close up view. In addition, the shoulder crystals, dorsal fins, horn, and the crystals at the end of SpaceGodzilla's tail are surprisingly sharp. As for posing, the figure has articulate joints in the arms, hands, legs, feet, tail, waist, neck, and head. While the joints allow for an impressive range of movements for the figure, SpaceGodzilla's performance is similar to that of the suit used in the movie in that it cannot really take many poses due to its huge bulk. Most of the flexibility is in the tail, which can be seen here, while the part having the least flexibility is the waist. As always, the flexible parts of SpaceGodzilla do offer the possibility of problems in that they can easily come off, although they are also easily attachable back to their respective slots. 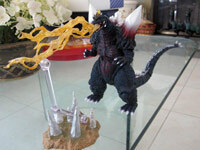 For accessories, SpaceGodzilla has equipment needed for him to simulate his corona beam. While the accessory isn't quite movie accurate, where as the beam was a single strand of energy that was released, the snaking and multi-fire affect is more visually pleasing. The accessory also comes with a stand that had crystals emerging from the ground. Unlike with Godzilla and Mechagodzilla, SpaceGodzilla's corona beam fits perfectly with the figure's mouth. As with its predecessors, the SH MonsterArts SpaceGodzilla has a high price tag; in fact, it's currently the most expensive figure in the line, which makes sense give it's currently the largest of the SH MonsterArts figures as well. As always, it is up to the buyer to consider making the purchase. 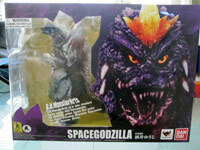 If the large price tag isn't a deterrent, this SpaceGodzilla will make a fine addition to fan's collections. My turn: now this is one of the coolest looking figures in the S.H. MonsterArts line. SpaceGodzilla is a mix of one of a kind design and beautiful paint. SpaceGodzilla is an interesting figure. He's poseable, yet not poseable. In fact, you're very limited as to what you can do. But, then again, SpaceGodzilla didn't move much in the film either so in that regard, he's film accurate. SpaceGodzilla is a awe inspiring figure with the crystal backplates being a thing of beauty. The backplates are translucent as are the shoulder spikes and the great looking tail tip. They are also very sharp so be careful when handling him. Also, one really cool feature is his translucent "crown horn" on his forehead. This looks great when lit by a background light! When it comes to accessories, a Corona beam effect, crystal base, and rod for the beam and stand are included. It looks really cool when posed and even cooler when you combine it with the crystal accessory that comes with the S.H. MonsterArts Little Godzilla. For articulation, SpaceGodzilla's arms bend at the forearm and can turn 360 degrees along with the hands. His head and neck can move up and down and rotate slightly. Be careful on movie the head in an upwards position though as it can pop off. You can easily just pop it back on however. SpaceGodzilla's legs can move back and forth and just like in the movie, not by much. The feet can move up and down which can make for some great standing poses and the knees are articulated as well. The knees also contain a free floating kneecap and lower knee section for better posing. The tail is VERY well articulated and very poseable. It does contain a few sections that are free floating as well. It's a strange design choice but it doesn't detract from the figure. Paint wise, SpaceGodzilla is pretty nice with a dark purple-fade to white paint job on the claws for the hands and feet. There are a couple of blemishes here and there but overall, it's pretty solid. The teeth are ok but have some missed spots in the mouth and the red paint in the mouth is slopped over on to the white of the teeth. The teeth have a really cool bone white color and look great on the teeth on either side of the mouth. 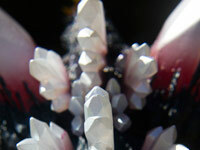 The crystal spikes (the non painted ones) look pretty good but have some purple paint marks here and there. The paint on the chest is a nice deep red that mixes in with the green mold of the figure nicely. The red on the upper arms looks really nice as does the red fade on the shoulder crystals. No paint problems at all. The eyes seem to be carefully placed stickers. 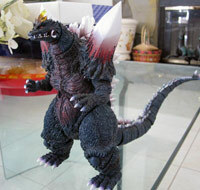 Sort of like how another figure in the line, Little Godzilla, the eyes are merely stickers. Overall, SpaceGodzilla is an awesome figure to behold. Aside from a few nitpicks, he is a must have for those looking to complete or looking to start their collection. I also want to add that he is a very photogenic figure too with all the areas of translucency on the body. SpaceGodzilla is out of print right now so if you can find him at a good price, get him asap!